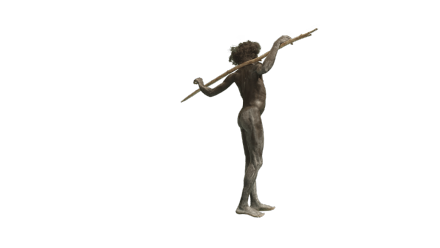 For the production of the digital dioramas at the new Moesgaard Museum, seven physically reconstructed human ancestors were combined with a virtual landscape, enabling the figures to retain their strong physical presence. A look through one of the seven sets of binoculars reveals the humans in their original habitat. 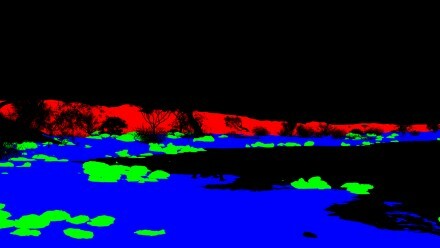 Viewers feel as though they are inside the landscape, circling around the figures. 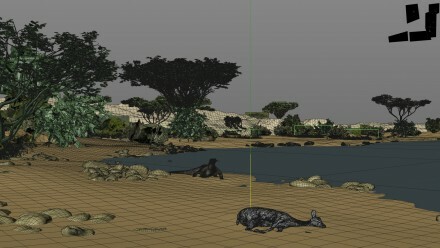 Before the landscape could be generated, sites, vegetation, fauna and possible interactions had to be defined. 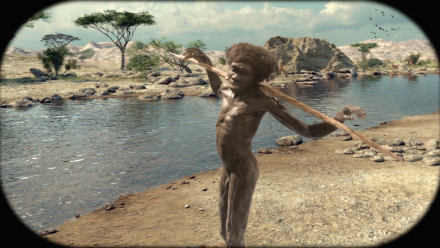 Everyday scenes portraying the ancient humans’ respective ways of life were developed in cooperation with museum scientists. It was also necessary to create a photorealistic replica of the staircase, since the spatial conditions of the site did not allow for rotations. We made the first rough animatics of the desired orbits in Cinema 4D, which were then successively refined. 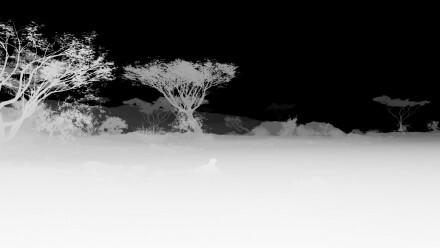 First we set the lighting atmosphere and incidence of sunshine, then we filled the scenes with trees, bushes, grasses, stones, and many animals whose occurrence has been scientifically confirmed. To create realistic ground and rock, a fair number of displacements had to be calculated. The rendering was done in Vray where, in addition to the beauty pass, several mask channels for the most important elements and a depth channel were rendered at the same time. 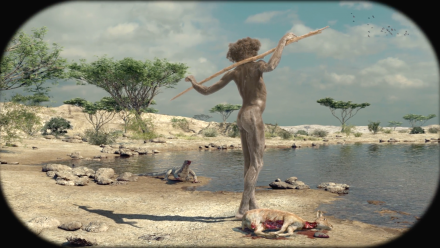 Fur, like that of the dead antelope in the Turkana boy scene, was calculated in C4D with the physical renderer. The virtual flight camera data was handed over as FBX to the company Mastermoves, which used a programmable crane system, the Milo Long Arm — one of only seven in use in the world — with a RED Epic to rotate the figures. 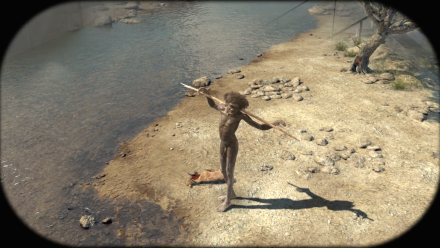 Identical lighting was also very important for the seamless integration of figure and computer animation. A real 360 degree orbit around the figures in greenscreen would never have been evenly illuminated. And the crane would have inevitably got into the light, so the figures were placed on a turntable. 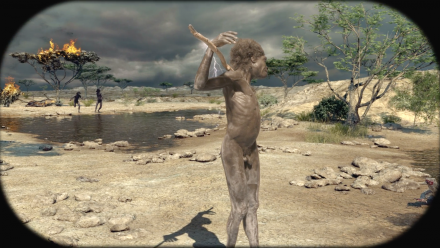 Reflectors were used for the surface ambient light, and an equally reflective 2,5 kW ARRISUN lit the figure exactly as set out in the 3D animation. The light had to be hung on a round traverse system so that its movement could be synchronised with the rotation of the figure. In this way, the orbit around the figure could be converted into translational motion of the camera and rotational movement of the figure. The shooting was done in multiple passes: in front of a greenscreen and a black background, so that the figures, very hairy in parts, could be cleanly isolated later. 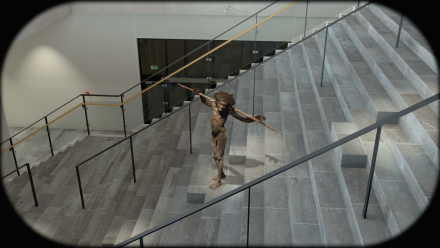 After the filming, everything was brought together in After Effects: the filmed figure, the rendered background, the staircase, and the separately rendered figure shadows. 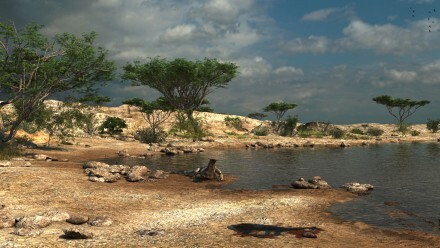 Motion blur, colour correction and small 3D elements, like the swarm of bees in the Sediba scene, were then added. Watch the construction of the 3D-renderings for post-production. The finished films are now image sequences on small computers in the foot of the binocular viewers. With a turn of a knob, the films can be played forwards, backwards and stopped at every point where the image of motion blur is replaced by one without, for the best image quality.